The Fall is rapidly approaching and I know you want to get more decorating done… but sometime you just don’t have the time! 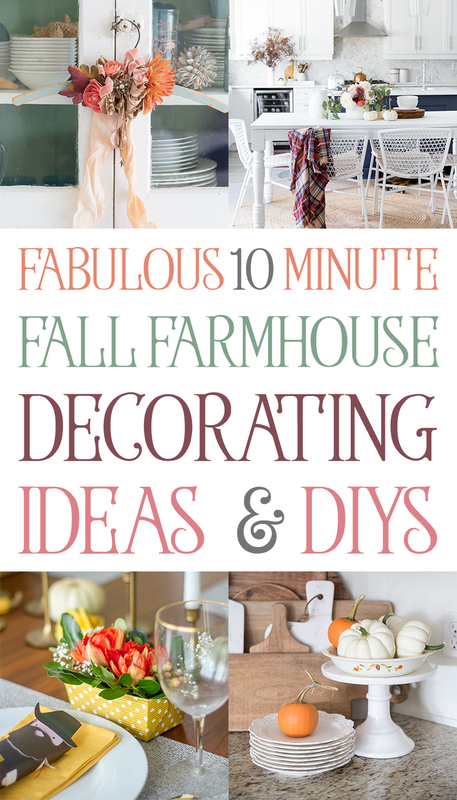 So I thought that you would find these Fabulous 10 Minute Fall Farmhouse Decorating Ideas and DIYS really helpful. You can create something special in the snap of a finger! All of these incredible bloggers have a treasure trove of Inspiration…Ideas…DIYS and more just waiting for you. Hope you enjoy your visit…simply click on the Blog Name in Color and it will take you to more Fall Fabulousness! What Farmhouse doesn’t love a DIY Olive Topiary or two! Lauren over at Bless’er House is show you how she makes one in 10 minutes…how awesome is that! A quick and easy touch of Fall for your home and perfect all year round. You won’t believe it but Yvonne over at StoneGable is going to show you how to put together a 10 minute Fall Farmhouse Vignette! Hop on over and enjoy! When you visit Lucy from Craftberry Bush she is going to show you ways to add a touch of Fall to your space in less that 10 minutes. 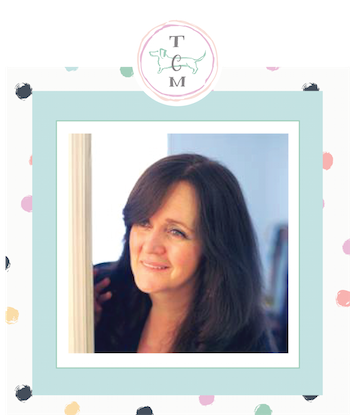 Just by adding a comfy plain blanket to her Kitchen Chair…you can feel the crisp Fall Breeze…she also shares other quick and easy tips you will love and love to look at! Dear Lillie Studio is sharing simple touches you can add in a snap! Simply by putting a cutting board on your counter…adding a bowl of fruit…a pretty dish towel and some little heirloom pumpkins you create the Fall Atmosphere! So quick…so easy…I don’t even think it will take you 10 minutes. Over at Shades Of Blue Interiors you will see how you can create the Fall Mood just by adding a grouping of Fall Branches to your favorite Vase…ez pz! Be sure to check the other ideas! Ella Claire Inspired shares her perfect little touches…one of them is…just add some White Pumpkins…they go with everything! There is so much more to see over at her lovely blog! We are visiting Yvonne from StoneGable once again because she is going to show you how to set up a Beautiful Full Coffee Bar in 10 Minutes…it’s magic! Dream Green DIY is going to show you how to make a lovely little 10 Minute DIY Mini Fall Floral Arrangement … make one for every setting or just a few to scatter wherever you would like a Fall Smile. Suzy over at Worthing Court always has a ton of ideas…this one will take you just about 10 minutes and it is a stunner! Find yourself a wonderful Tote…fill it with Hydrangea’s Faux or Dry…VOILA…Fall at its finest. Now for a touch of French Fall over at French Country Cottage! So much to see here but I love how she just uses some candle sticks…stacks wood slices…adds a copper and fills a small Dough Bowl with Fall Fruit…a perfect symphony of Fall in minutes! 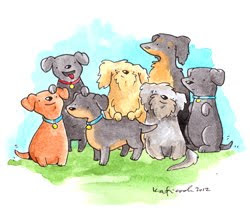 Come on over for a bit more of OOOO lala and check out the new book. KariAnne over at Thistlewood Farms just adds blooms to a vase…plums in a bowl…some grapes…a little bowl of pinecones …berries and some yummy treats. This is something you can arrange in 10 minutes and dazzle your guests! 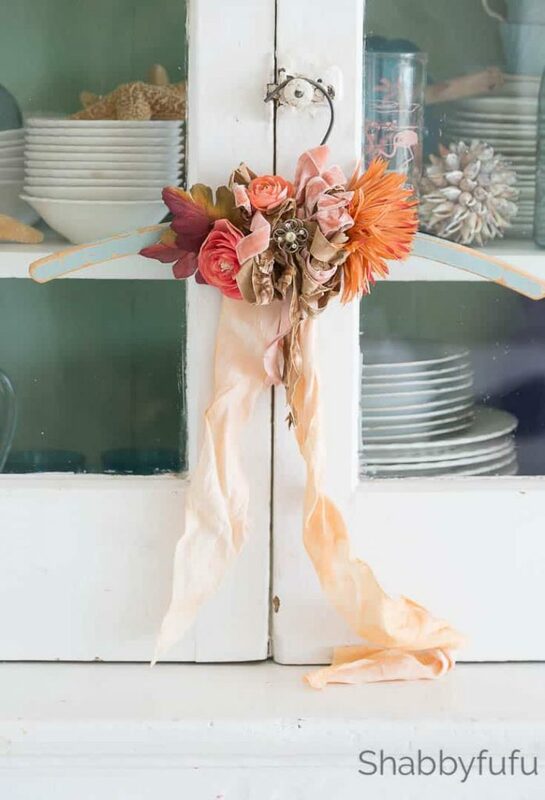 Lauren over at Bless’er House is sharing 8 Fall Decorating Tips…not only are they time efficient but budget friendly. 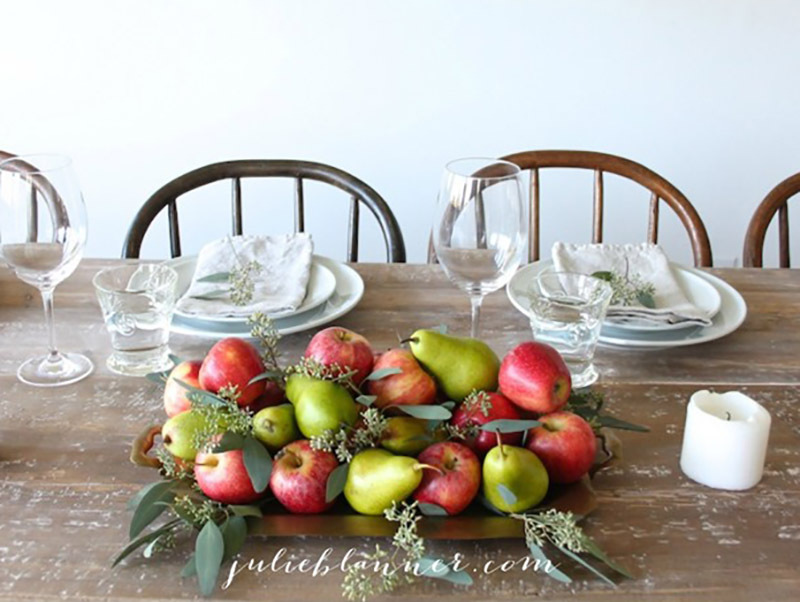 Just like this idea…place a beautiful Pear on each place setting with Pumpkins in a basket…sprinkle with Cranberries and there you have it…a wonderful Fall Table in 10 Minutes! For other great tips like this…please visit her…she will be waiting with some Hot Apple Cider! Oh…I am in love with this Brilliant Idea from Michael over at Inspired by Charm…he simply makes a dessert plate by placing a dish with some pretty Faux Leaves on it onto of a Pumpkin…GENIUS…just add cake pops…cinnamon donuts or whatever Fall treats you desire! Takes less than 10 minutes and looks simply amazing. When you visit…he has 9 more sensational Quick and Easy Fall Decorating Ideas waiting for you. Liz Marie is sharing some Inspirational Cozy Farmhouse Fall Decor Ideas…my favorite will take you 10 minutes…just add moss to the top of your Mantel and then add a row of Pears…how incredible does that look. If you love this one…you will adore the other ideas she is sharing! Rachel over at Maison de Pax is going to show you some fabulous 10 minute Decorating which includes this beautiful Centerpiece and she also has a wonderful 10 Minute Fall Wreath waiting for you too. In a snap you will be Farmhouse Stylin for the Fall! You are in for a Treat!!! Come on over to Rooms For Rent where Bre is going to show you how to make 3 DIFFERENT Centerpieces in 10 minutes. This one is fabulous and so simple and there are 2 more styles and DIYS! How awesome is that! Now for a little Farmhouse Glam Shabbyfufu aka…Janet is going to show you how to make this Antique Wood Hanger Wreath in 5 Minutes (but we are going to give it 10 : ) Don’t you just love this and of course you could put your own twist on it too to make it perfect for your Farmhouse. Now Emily A Clark shares some Super Quick Apple Centerpieces to share with us that are done in a snap. She will have you done with this beauty in 10! Come and check out the others : ) Enjoy! 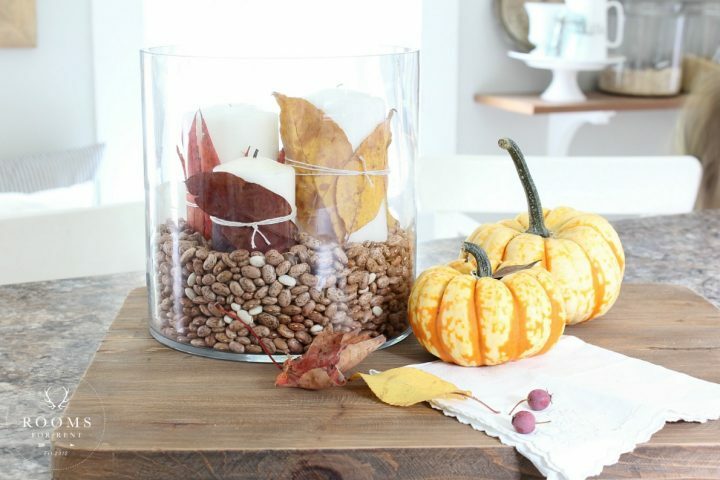 Over at Little Glass Jar you are going to see how simple Fall Decorating can be. 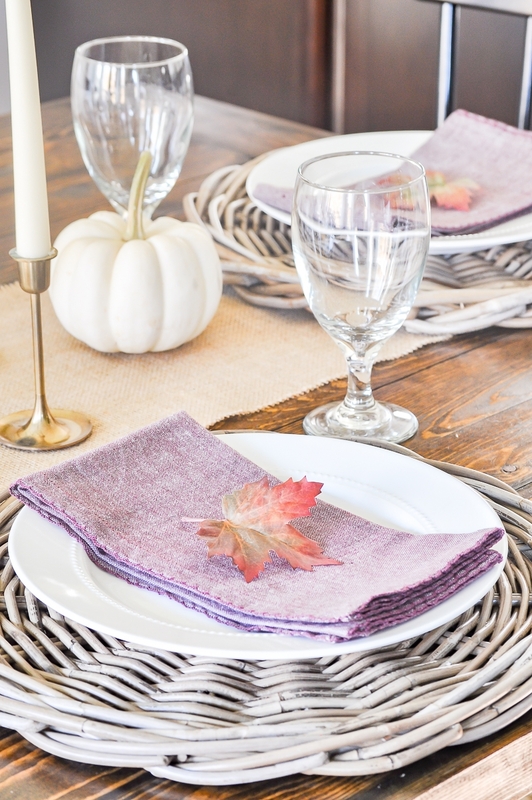 Ashley is going to show you how just by adding a pretty leaf to your napkin turns your setting into Fall! It doesn’t get more simple yet elegant than this. Drop by to see the entire tablescape…I know you will be totally inspired and leave with many ideas. Last but not least…Diane over at In My Own Style is going to show you that a brown paper bag can be your friend if you are looking for a fun planter for your Flowers! Come and see how she puts this together in …you guess it…10 MINUTES!! !